On Thursday night, Peter and his friends had courtside tickets to Knicks-Spurs, a gift from a family friend that meant an up-close view of the game in which Stephen Jackson injured himself tripping over Mike Bloomberg's waitress and J.R. Smith did this. After it ended, they did what anyone would do after spending a few hours next to (and drinking with) the beautiful people in the rarefied air that rings the court at Madison Square Garden: They pushed their luck. In this case, that meant wandering off the court after the final buzzer to see if they could find their way into the Knicks' locker room. They did. Easily. Peter says that, in lieu of leaving, he and his friends did their "best to follow the celebrities and beautiful women making an exit on the floor," which should probably be step one for anyone looking to weasel their way into a locker room after a basketball game. The famous and/or attractive people, a group that reportedly included Star Jones, Howard Stern and Whoopi Goldberg, led Peter and his friends to a garage that held the Spurs team bus, the cars of a few Knicks, and, presumably, the cars waiting for the celebrities. From there, the group—"dressed to the nines" for the occasion and "drunk but not too hammered"—had a choice to make: hang out in the garage and get slowly exposed for the non-celebrities they are, or slip into a hallway and hope that this run of inexplicable access could be extended. They found a hallway, off of the garage, that was "covered in Knicks memorabilia." As it turns out, it was the hallway where Gregg Popovich was to do his postgame media availability. 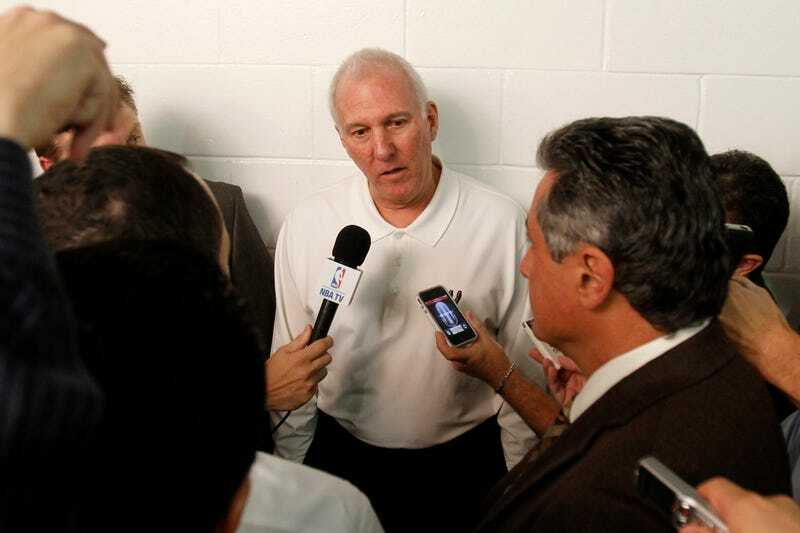 Amazing: A bunch of NBA beat reporters sticking tape recorders in Gregg Popovich's face, and when they finish up, one of four random guys—who were "looking like Patrick Bateman and the rest of the yuppies from American Psycho" and stifling laughter—decides to chime in with a question about a player that killed the Spurs that night, while another films with his camera a few feet away. And Pop answers it! J.R Smith had a solid game tonight—20 points, lotta minutes—did you guys have a strategy defending him, coming into the night? "Whatever we planned didn't work. [Terrifying pause.] He's a scorer. He's a good scorer. Heck of an offensive player. He's playing much harder, defensively, than he has in the past, so he's buying Mike's message." The group then moved on to the Knicks locker room on the end of the same hallway, where again no security official asked them who they were. There, they doled out high-fives and tried to look inconspicuous. "Players," reports Peter, "were literally walking out of the showers with towels around their waists." A security guard finally approached the group as one of them tried to snap a cell phone picture of a half-naked Carmelo Anthony, and the jig was up—the guard asked if they had any credentials, Peter answered with "a swift 'nope,'" and soon the first security guard was calling over more security guards. Fearing a lifetime ban from Madison Square Garden, the group attempted a daring escape by blending in with a gaggle of reporters that had just finished their postgame player interviews. The guards caught up with them, however, grabbed them by the scruffs of their respective necks and...did nothing. The foursome was escorted to a private exit and sent on its way. They guards didn't even inspect their cell phones! The conclusions are obvious. If you act like you belong, you do belong. If you start taking taking pictures of players in towels, someone will notice and boot you out. The larger message, though? Push your luck. You might get to jab Gregg Popovich about the damage your favorite player did to his team that night, and that's an experience worth taking a couple risks for.